It's not commonly known that basil originated in India. Basil was brought to the Mediterranean via the spice routes in ancient times and spread to other parts of Asia. Basil became popular in the use of curries in Thailand, as well as Italian cuisine. In Romania, basil took a more romantic turn; when a man accepts a sprig of basil from a woman, he is officially engaged. The Greek word for basil means royal or kingly and was believed that only the king himself should harvest this herb, and only with the use of a golden sickle. No matter what the country the consensus is that basil is Royalty amongst the herb family. 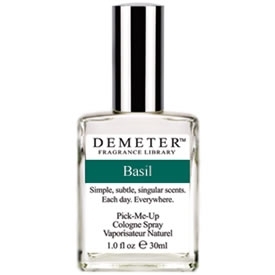 Demeter’s Basil Pick-Me-Up cologne is made from essential oil distilled from sweet basil, the kind most commonly grown in herb garden and used in cooking-a fragrant and unforgettable scent. Mix with our tomato scent and you can make some bruschetta!